Perfect skin care in London. Ever since Cleopatra took milk baths to preserve her skin care beauty, it has been the quest of many people to improve their skin and delay the effects of ageing. Environ’s skin care vision has always been to make the best skin care in the world, through a philosophy of well researched, scientific skin care. Environ skin care products are effective, proven, cost-effective and inspired through teamwork. As a brand Environ value and perform extensive research and development to offer all customers exceptional skin care products. Environ strive on offering the most effective skin care range that science permits. ★★★★★ Really lovely facial and Sheena is brilliant, I will be coming monthly for this treatment now! ★★★★★ Amazing massages, Sheena was superb. As always! ★★★★★ Very friendly and professional. ★★★★★ Sheena is very skilled at massage and always does an excellent job. I’m moving out of the area but will definitely make the effort to come back just for this! ★★★★★ Sheena is always informative and I have never experienced such brilliant Environ Facials. Which Facial should I book? All our Environ Facials will be tailored to your skin care needs. We would recommend the 60 or 90 minute for your first Facial. The Active Vitamin Serums in this Facial will leave your skin looking radiant and dewy. Active vitamin forms of vitamin A, C and antioxidants are driven deep into the lower layers of the skin using small electrical pulses. This approach stimulates collagen to soften lines and improve elasticity, Increase Hydration and Boost Radiance. It is suitable for All Skin Types and is particularly effective at addressing Sun-Damage, Pigmentation, Premature ageing, Dryness, Uneven Skin Tone and Scarring. The serums are used in Environ’s own STEP-UP SYSTEMTM to bring you the healthiest and most beautiful skin for a lifetime. The Environ Exfoliating Peel Range is developed specifically for light repetitive peeling to smooth and brighten the skin. The strength of the peel can be varied, which enables therapists to create bespoke treatments for clients. This facial uses levels of lactic acid which achieves measurable results without sensitising. Great for congested, Photo Damaged or Problematic Skin and Excessive Redness. The perfect antidote to Dry Skin, Lacklustre Skin. Using Hyaluronic Acid, which holds 1000 times its own weight in water, it helps to reduce fine lines caused by dehydration and increases the plumpness of the skin. This is a perfect facial for any special occasion, great for brides! This highly effective treatment uses a special pentapeptide serum to target Frown Lines. The unique combination of active ingredients is driven deep into the skin with gentle pulses it helps soften lines and reduce muscle tension in the forehead. This is an ideal Smoothing Skin treatment for that Smooth Skin Feeling look and feel without any invasive procedures. The treatment uses gentle sound waves to drive a special nutrient-packed serum deep into the lower layers of the skin. The formula contains a unique combination of three peptide complexes which work in synergy to give skin a plumper, more radiant appearance. 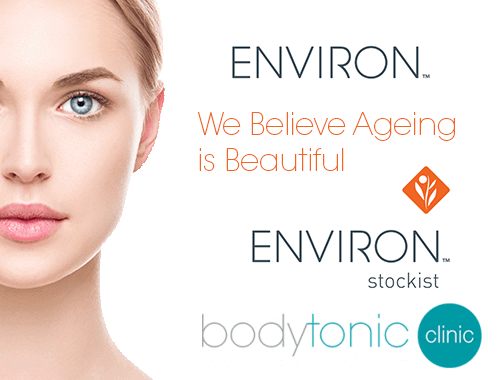 Here at bodytonic clinic we believe in entire body health including the skin, this is why we have chosen the Environ facial skincare range. Not only is it a cosmeceutical product that has been created by a world renowned South African plastic surgeon Dr Des Fernades, but it is also one of the only products available on the market (without prescription) which has such high levels of Vitamin A.
Vitamin A is naturally found within the skin and is known to deplete the older we get. It has been proven to be the best anti ageing ingredient for the skin and one of best to normalise and bring the skin into perfect balance and natural health. Along with Vitamin A, Environ contains Vitamin C and antioxidants which brighten and hydrate, also helping the skin repair itself in our ever growing polluted and stressful world. All our facials include cleansing deep into the skin, focusing on congestion and manually removing white heads and Milia where possible. Our Environ facials are packed with high levels of all these ingredients. We use the environ Ionzyme DF II machine to help push these products even deeper into your skin for longer lasting results. The use of this machine will give you great results and is a non surgical solution to prolong the health and youthful appearance of your skin. 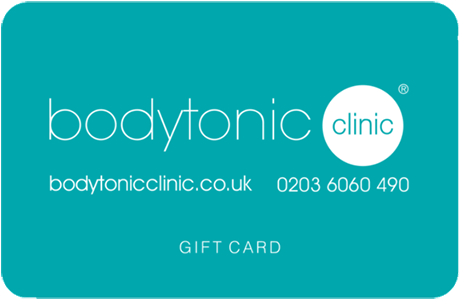 Purchase a Gift Voucher Today! 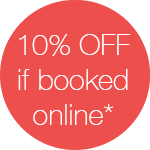 Your 10% online Discount is on a discountable treatment only.